Students, faculty, and irrigation canal company officials at the spillway out of Logan-Hyde Park Canal, 1896-1913. A lot of people who move to Logan, Utah, from out of state have this moment when they think a water main must have ruptured because there’s a lot of water gushing down the street. Nope. That’s just ditch water and many people have to figure out how to get water from the that ditch to their lawn or vegetable garden and there are no instructions for this. 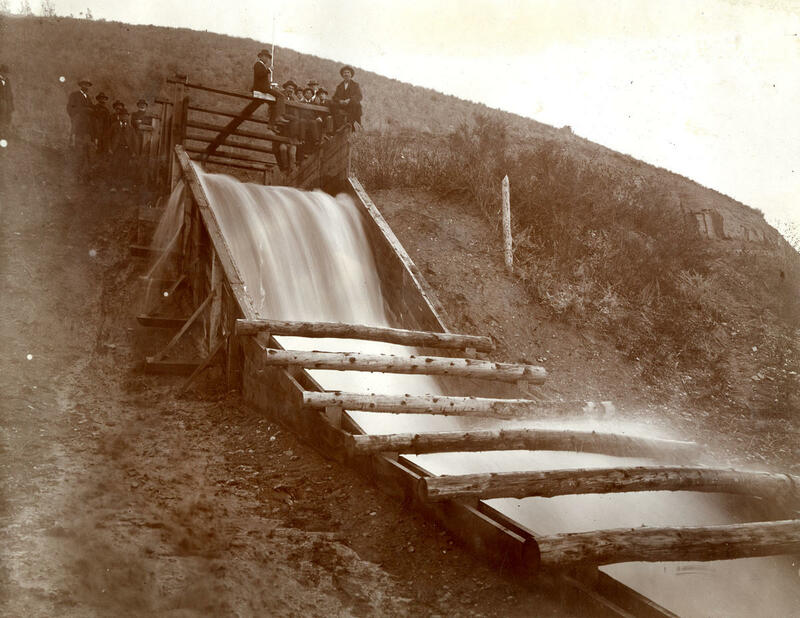 This episode of The Source is all about irrigation -- the kind that farmers do and the kind that residents of Logan have to do with a system that was designed by the very first settlers to the valley. We’ll talk about what’s changed, what hasn’t and what needs to when it comes to watering your lawn or tomatoes. More than 80% of Utah’s diverted water is used for agriculture, but only a small portion of that is for growing vegetables. Most is used for alfalfa and pasture land. The Source’s Ross Chambless looks into how farmers are saving water by simply changing what they grow in an increasingly urban environment. Residential lawns and gardens are not considered agriculture, but when many Utah towns were settled, there was no commercial farming and therefore no distinction. Jennifer Pemberton looks at how leftover pioneer irrigation systems -- still in use in Northern Utah -- muddy the waters between what’s residential, what’s agricultural, and what’s a gift from God. Kathryn Morse is a professor of history and environmental studies at Middlebury College in Vermont. But many years ago she lived in Logan, Utah, where she studied the canals of the Logan River and wrote a paper called “Nature's Second Course: Water Culture in the Mormon Communities of Cache Valley, Utah, 1860-1916.” She talks about what was particularly Mormon about the pioneering irrigation systems in Northern Utah. Shareholders of the Logan and Northern Canal now have water restored to their access points, according to project spokesperson Andy Neff. In July 2009 a breach in the canal caused a landslide that killed 3 residents of Cache Valley. Due to the closure of that section of the canal, shareholders have not been able to access irrigation water from the canal. Road work on the sections where the road was cut to lay pipe for the canal is expected to begin the week of May 20th and continue through the end of the month. Controversial Canal Rebuild in Cache County Has "Many Tentacles"
Residents living near Lundstrom Park in Logan concerned with a proposed plan to pipe a nearby canal will meet with members of the Logan City and Cache County Councils. About a dozen citizens and members from both councils requested the meeting with engineers to discuss the canal rebuild design. They say the original piping plans included the use of a concrete box culvert to move water through the canal. Now, engineers say they will request a permit from the Logan Planning Commission for a plan that calls for the water to flow through an underground pipe.